Wolves midfielder Jed Wallace has become the Championship club's latest injury casualty and will be out for up to six weeks with a thigh strain. The 21-year-old suffered up the injury late on in Saturday's 1-1 draw at Championship leaders Burnley. 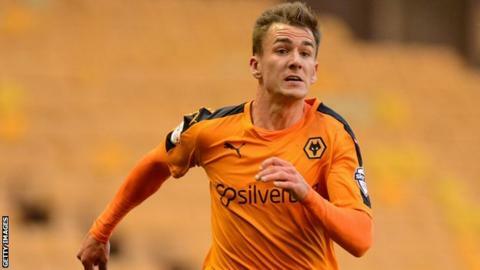 After being recalled early from loan at League One side Millwall, he was making his first Wolves start in five months. But there is now a chance he may not play again this season, after being ruled out for a minimum of four weeks. "We will have to see how he progresses," said Wolves medical chief Phil Hayward. "He has sustained an injury to his left quad and scans have revealed it to be a grade two injury. "He has a chance to be back and available before the end of the season. He will be out for probably four to six weeks." Wolves boss Kenny Jackett is now without eight first-team players. Striker Nouha Dicko, wingers Razak Boukari and Jordan Graham and defender Ethan Ebanks-Landell are all out for the season, while centre-half Mike Williamson, winger James Henry and midfielder Dave Edwards are also absent. Edwards, who is on course to return from his broken foot next month, is still hopeful of being fit for Wales' Euro 2016 campaign this summer. Williamson and Henry could return sooner, having been lined up to resume training following the Easter weekend. Beacuse of the international break, Wolves do not have a game until Saturday 2 April when they host former manager Mick McCarthy's Ipswich Town.